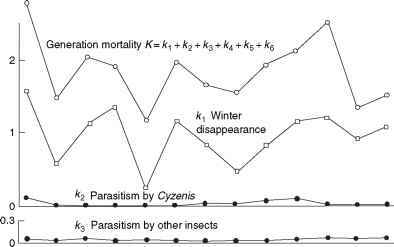 Figure 2 Dynamics of rates of major mortality processes (k-values) in the winter moth population in Great Britain. From Varley GC and Gradwell GR (1960) Key factors in population studies. Journal of Animal Ecology 29: 399-401.
immediate cause of death which is identified from examining dead organisms. However, the rate of mortality due to this cause may depend on many other factors. There is a many-to-many relationship between mortality processes and factors that affect their rates. Predation rate depends on the numbers of predators, their developmental stage, and feeding rate which may appear weather dependent. It also depends on the numbers and accessibility of prey, and may be modified by the abundance of alternative food (e.g., birds often switch to eating the most abundant prey species). Each factor may affect multiple mortality processes. For example, unusually dry weather may reduce the number of natural enemies, and hence affect predation and parasitism rates in insect herbivores. In addition, it may reduce the defense capacity of host plants, and hence lower the rate of insect mortality due to unfavorable food chemistry (e.g., tannins). Because of this complex relationship between environmental factors and rates of mortality processes, it is better to avoid the ambiguous term 'mortality factor', which was widely used in earlier ecological literature. The effect of factors on mortality rates can be predicted from theoretical models and/or measured directly. For example, the Lotka-Volterra model predicts predation rate as a function of predator and prey density. It is based on a simple assumption that predator and prey meet randomly and prey die after each encounter with a predator. This model can be further improved by assuming that predators stop searching when they are saturated, or that they can eat alternative species of prey. Physiological models may predict mortality rates due to starvation. These models trace the dynamics of energy resources and metabolism and can predict the relationship between food limitation and mortality. Although theoretical models are useful for predicting the effect of factors on mortality rates, these predictions need to be verified experimentally before making any conclusions. The effect of individual factors on mortality can be measured either in controlled experiments where all other factors are fixed, or in multifactor observations, or in active experiments in nature where some factors are manipulated and the change of other revelant factors is recorded. The first method gives most consistent results and is widely used to evaluate the toxicity of chemical compounds. For example, the toxicity of pesticides is determined in dose-response experiments where insects are exposed to a series of dilutions of the pesticide. Then mortality is plotted against the log dose of the pesticide and this relationship is approximated by a logistic model. A dose of the pesticide that kills 50% organisms comparing with control, which is called a 50% lethal dose or LD50, is estimated from the model. The smaller the LD50, the more potent the pesticide. The same method can be applied to evaluate nontarget toxicity to laboratory mammals (e.g., mice, rats) and to other nontarget organisms (e.g., protected species of insects and aquatic fauna). 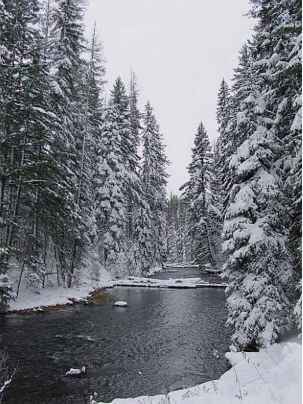 However, controlled experiments may fail to reproduce modifying effects of other factors in natural populations. For example, toxicity effects of pesticides in nature are usually smaller than in the lab. Thus, multifactor observations or experiments in natural populations are also important. Passive observations require large sets of uniformly collected data with a considerable span both in time and space. Varley and Gradwell monitored the dynamics of the winter moth on five selected oak trees, which is not sufficient to capture large-scale patterns in population dynamics. Data can be analyzed with a logistic regression of mortality rates versus all measured factors. The relationship between factors and mortality rates may appear nonadditive if the effect of one factor is modified by another factor. For example, gypsy moth larvae become less sensitive to viral infection if they have a tannin-rich diet (e.g., oak foliage). However, most informative are active experiments where some factors are artificially changed and their effects are then traced over several years. An example of such experiment was a local mass release of gypsy moth eggs in New England. The result was entirely unexpected. Instead of a local outbreak of the pest density, the population was completely eliminated by parasitoids which aggregated to the infestation from the neighboring area. This experiment clearly showed that parasitism rate depends on parasitoid numbers in a large area rather than on their numbers at the release site.